The Russell Cave National Monument is a United States National Monument in northeastern Alabama, United States, just south of the Alabama-Tennessee border. With a mapped length of 7.2 miles (11.6 km), Russell Cave is the third longest mapped cave in Alabama. It is ranked ninetieth on the United States Long Cave List, and is currently listed as number 314 on the World Long Cave List. The cave is named for Thomas Russell, a veteran of the American Revolutionary War who owned the land above it. In 1958, the cave and site area–310 acres (1.3 km²) of land–were donated by the National Geographic Society to the American people. The Monument was established on May 11, 1961 and is maintained by the National Park Service. The National Monument was listed on the National Register of Historic Places on October 15, 1966. Its exceptionally large main entrance was used as a shelter by prehistoric Native Americans from the earliest known human settlement in the Southeastern United States, through to the era of European colonization. The surrounding forest provided food, tools and fuel for fires. The site contains the most complete record of prehistoric cultures in the Southeast, offering a nearly continuous record of human habitation dating to at least 7000 B.C.E., including artifacts from the Archaic, Woodland, and Mississippian cultures. The rock from which Russell Cave was carved was formed over 300 million years ago at the bottom of an inland sea covering the region. Due to continental drift, the area that is now northeast Alabama was located very close to the Equator at the time this limestone was forming. This area is now located in a temperate climate, but 300 million years ago it was a shallow, tropical sea. Carbonaceous deposits of skeletons and shells were slowly transformed into limestone. Rainwater, mildly acidic from atmospheric carbon dioxide, slowly dissolved a portion of the limestone rock resulting in the formation of the cave. About 9000 to 12,000 years ago, the collapse of a cavern roof beneath a hillside near Doran's Cove created a sinkhole and exposed Russell Cave. Until shortly before the first occupation by Native Americans, the cavern was uninhabitable due to the presence of a large stream which occupied the entirety of the cavern. A fortuitous rockfall from the cavern roof diverted the stream to one side, however, exposing a portion of the cave floor. The first occupants dwelled on this irregular floor of rock slabs. Debris from occupants and deposits falling from the ceiling slowly raised the floor. The floor ultimately was raised an additional seven to eight feet (2.0 to 2.5 m) and up to 30 feet (9.0 m) near the upper entrance. In the 1960s, the United States Bureau of Mines installed bolts with a length of 15 feet (4.5 m) to prevent additional collapses of limestone rock. The cave mouth faces to the east preventing the ingress of cold north and northwest winds and allowing in the morning sun. According to a published cave map, the cave has five entrances in addition to the Main Entrance. Three of the entrances are referred to as Canoe Entrances while the other two are named the Picnic Entrance and Pig Entrance. A natural spring flows into the cave and travels underground for 1.5 miles (2.5 km) before joining Widow's Creek and, ultimately, the Tennessee River. Studies of historical geology and paleobotany have shown that the flora and fauna of the Eastern Forest Region remained essentially unchanged for thousands of years. This began to change with the arrival of European settlers who removed trees for timber and to open land for subsistence farming and commercial farming. The cave is populated by both the brown bat and northern long ear bat. The cave stream contains fish known as sculpin. Snakes of the surrounding area include the copperhead, timber rattlesnake, rat snake, and kingsnake. Over 115 species of birds have been identified by researchers at Russell Cave, a site on the North Alabama Birding Trail. Although the site is now below the southern boundary of their range, porcupine bones have been found in digs at the earliest occupational levels. The peccary, also hunted by the occupants, is no longer found in this region. Chipped flint points and charcoal from campfires provide evidence that occupation of Russell Cave began nearly 9000 years ago by Archaic period Native Americans. The charcoal remains of the first fires in the cavern date to between 6550 and 6145 B.C.E. based on radiocarbon dating. As they maintained their existence as hunter-gatherers, it is likely that the cave was only occupied during the autumn and winter seasons. 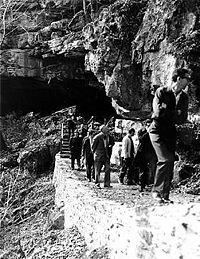 According to John Griffin, the issue of seasonality (during what season or seasons the cave was utilized) remains to be determined. Evidence indicating inhabitation in autumn and winter include deer bones and passenger pigeon remains. The presence of shellfish artifacts clouds the determination somewhat since shellfish would have been easier to procure during periods of dry weather in mid-spring and late summer. However, William Clench has suggested that the occupants may have brought mussels and snails to nearby bodies of water (Dry Creek and/or Crownover Springs) for use as needed including in autumn or winter. Based on the existing information, Griffin is "strongly inclined" to view Russell Cave as a place of winter occupancy. In addition to serving as a shelter (presumably for several related families totaling 15 to 30 individuals), the cave would have provided a constant source of water due to the lack of freezing temperatures in the cavern. The surrounding hardwood forest and nearby Tennessee River served as sources of food throughout the year. The food sources would have included aquatic animals (fish, turtles, shellfish), birds (including turkey), small mammals (squirrels, raccoons, rabbits, gray foxes, skunks, bobcats, porcupines, peccaries), nuts (including acorns), seeds, and roots. Larger animals such as deer and black bears were also commonly hunted when the seasons permitted. The dominant animal food sources for these occupants were deer and turkey. As gatherers, these occupants also would have consumed fruits and berries although these plant foods may have been scarce or unavailable during the seasons of cave occupancy. Generally speaking, hunter-gathers relied more heavily on plant foods than they did animals. Indirect evidence of gathering includes pits for storage of nuts and seeds, mortars and pestles, and nut stones. Goosefoot, also referred to as Chenopodium, is a small flowering plant with edible seeds that may have been cultivated in small gardens. The evidence for this is uncertain, however. This also leads to an uncertainty in the timeframe of the suspected cultivation (believed to be during Archaic or Woodland periods). These early cave dwellers were efficient consumers of game. Flesh was roasted or stewed while hides were made into clothing and bones were made into tools. The chief weapon of these occupants was a short spear (tipped with stone point) propelled by an atlatl (throwing stick). The points were chipped from chert which occurs as nodules and veins in limestone near the cave. Chert was also utilized to fashion knives and scrapers. They turned bones into awls and needles indicating the production of clothing from hides or manufacturing of baskets. Small pieces of bone were also used to make fish hooks. No ornamental works have been found in this layer of deposits. Other items such as baskets and articles fashioned from wood and hides were probably produced but have not been preserved by the soil. Around 1000 B.C.E., the implements of the Native Americans utilizing Russell Cave underwent a dramatic change. Pottery appeared for the first time. Smaller weapon points indicate that the bow and arrow had replaced the atlatl. Tools fashioned from bone were more refined. Other domestic implements provide the first evidence of gardening at the site. Additionally, bone and shell appear in ornamental artifacts. Evident throughout the Woodland period is an increase in the amount of hunting at the expense of other activities. During this period, it is clear that the cave had become simply a hunting camp. In the seasons away from the cave, the natives probably joined other groups at summer villages larger than those of the Archaic period. 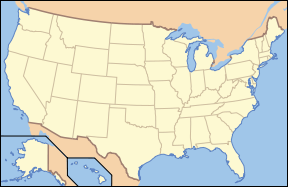 These changes occurred in groups throughout the eastern United States marking the beginning of the Woodland period. During this period, burial mounds were first built, the population increased, and trade became important. Changes in the shape and style of artifacts at Russell Cave during the Woodland period serve as a basis for identifying cultural subdivisions within the period. For example, early pottery of the period is decorated with fabric impressions while later pottery is decorated with impressions made by carved wooden paddles. After the close of the Woodland period (around 500 C.E. ), Native Americans made less and less use of Russell Cave. Occasionally, small parties of hunters left objects distinct from those of the Woodland period occupants. These visitors (Mound Builders of the Mississippian period) came from permanent villages which had successfully implemented agriculture near the rich river bottomlands. The last occupants departed around 1000 C.E. Centuries later, Cherokee occupied this part of the Tennessee Valley. They and the subsequent European settlers made little use of the cave. The few objects that they left were found very close to the surface. The only modern historical artifact found at the site was a metal fishing hook. The expedition of Hernando de Soto passed within 100 miles (160 kilometers) of Russell Cave in 1540. Russell Cave was named after Colonel Thomas Russell, a veteran of the American Revolutionary War from North Carolina, who owned the property at the time when maps of the area were drawn. The surrounding land called Doran's Cove is named after Major James Doran, the brother-in-law of Russell and the original owner of the land. The land was purchased by the National Geographic Society and donated to the American people. The area was designated as a U.S. National Monument in 1961 during the presidency of John F. Kennedy. Archeological field surveys have uncovered the records of the cave's occupants. Approximately two tons of artifacts have been recovered from the site. These discoveries include charcoal from fires, bones of animals (as remains of hunted game and as bone tools), spear and arrow points, sherds of pottery, and the remains of several adults and children buried at the site. The bodies, ranging in age from infant to 50 years, were buried in shallow pits in the cave floor and were not accompanied by artifacts. The first relics were discovered in 1953 when four members from the Tennessee Archeological Society and University of Chattanooga began digging in the cave. This first excavation reached a depth of six feet (1.8 m). Upon realizing the extent and importance of the site, they contacted the Smithsonian Institution which conducted three seasons (1956-1958) of archeological digs in cooperation with the National Geographic Society, reaching a depth of more than 32 feet (9.8 m). An additional excavation was performed in 1962 by the National Park Service to a depth of 10.5 feet (3.2 m). This final excavation completed the archeological record and established an on-site exhibit. Analysis of the distribution of the artifacts among functional categories (fabricating and processing tools, domestic implements, weapons) using an experimental technique proposed by Howard Winters reveals that the ratio of non-weapon artifacts to weapons was very low. This is indicative of a hunting camp with lack of permanent occupancy. It should be noted that the picture of prehistoric life gained from Russell Cave is incomplete due to the incomplete nature of archeological records and because Russell Cave only represents a portion of the annual life cycle of the inhabitants. 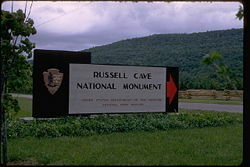 Russell Cave National Monument was established on May 11, 1961. The archaeological site contains the most complete record of prehistoric cultures in the Southeastern United States. 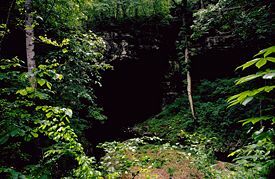 Russell Cave is one of the most extensive cave systems in Alabama with over seven miles (11 km) of mapped passageways. Due to the discovery of several rare species (including a species of scorpion that exists nowhere else in the world other than Russell Cave) recreational caving is no longer allowed. Guided tours of the cave shelter are conducted by National Park Service Interpretative Rangers. Only the cave's entrance chamber can be visited without special permission. 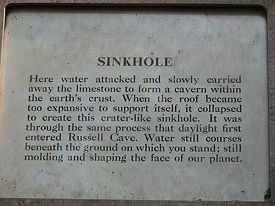 The cave is entered through a sinkhole, formed by the collapse of the cave's roof. A light and sound show in one of the excavations, explains the stratas of the dig. The cave shelter includes the areas that were occupied by the ancient groups and features a diorama depicting activities of the occupants. Scenes of the life of the Prehistoric Indians with life-size mannequins portray the knowledge gained by archaeological excavations. The Gilbert H. Grosvenor Visitor Center at the monument, dedicated in 1967, is named after Gilbert Hovey Grosvenor, the editor of National Geographic Magazine from 1903 to 1954 and president of the National Geographic Society from 1920 to 1954. The center operates as a small museum with displays of artifacts and relics from the cave, accompanied by documentary films educating the public on the lifestyles of prehistoric peoples who used Russell Cave. There are two walking trails on the acreage surrounding Russell Cave: the Nature Trail, a 0.6-mile (1.9-km) paved trail, and the Backcountry Trail, a 1.2-mile (1.9-km) dirt trail. Both trails provide good opportunities to experience the forest and wildflowers in the area. Points along the trails feature plants utilized for food, tools, and other daily necessities. Each year during the first weekend in May, the Russell Cave National Monument hosts a Native American Festival. The festival includes performances of storytelling, dancing, and Native American flute playing. A historical reenactment of a Cherokee encampment is conducted. At this event and at other times throughout the year, demonstrations of Native American lifestyles and weaponry are conducted. Weapons demonstrations include flintknapping to produce points (arrowheads), use of the atlatl for spear throwing, and use of a bow and arrow. Other demonstrations feature wood carving, handbuilding of pottery, and fire building. 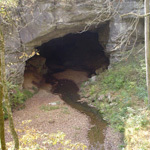 Russell Cave National Monument is Site 44 on the Northeastern Loop of the North Alabama Birding Trail. This is not a "trail" in the traditional sense of the word but a series of mostly roadside stops throughout northern Alabama selected for their birdwatching characteristics. Although many types of birds are present, this site is known for its tanagers (Summer Tanager and Scarlet Tanager) and the Yellow-billed Cuckoo. During migration, almost any species of eastern warbler and vireo can be spotted in the park. The prime seasons for watching the songbirds include spring, summer, and autumn. ↑ 2.0 2.1 2.2 GORP. Monuments - The Story of Russell Cave Retrieved December 9, 2008. ↑ 3.0 3.1 3.2 3.3 U.S. National Park Service. Russell Cave National Monument - Frequently Asked Questions Retrieved December 8, 2008. ↑ 5.0 5.1 U.S. National Park Service. Geology Fieldnotes - Russell Cave National Monument Retrieved December 9, 2008. ↑ William J. Clench. 1974. "Mollusca from Russell Cave" in Investigations in Russell Cave (Publications in Archeology 13). National Park Service, U.S. Department of Interior. ↑ 14.0 14.1 Jochen Duckeck. Russell Cave National Monument Show Caves of the United States. Retrieved December 9, 2008. ↑ Howard D. Winters. 1963. "The Archaic Period" in Illinois Archaeological Society Bulletin. volume 1. ↑ Harvey Chipkin, November 23, 1992, "State aims to lure ecotourists with its natural attractions" in Travel Weekly. Chipkin, Harvey. November 23, 1992. "State aims to lure ecotourists with its natural attractions" in Travel Weekly. Griffin, John W. 1964. Preliminary Report on Excavations at Russell Cave National Monument. Southeastern Archaeological Conference Bulletin 1: 3335. Griffith, Lucille B. 1987. Alabama: a documentary history to 1900. University of Alabama Press. ISBN 0817303715. Grosvenor, M. B. 1958. "National Geographic Society Presents Russell Cave to the American People." National Geographic 113: 438. Hack, John T. 1974. "Geology of Russell Cave" in Investigations in Russell Cave. (Publications in Archeology 13). National Park Service, U.S. Department of Interior. Johnson, Jay K. 1993. The Development of southeastern archaeology. Tuscaloosa: University of Alabama Press. ISBN 0817306005. Lee, Richard Borshay, and Irven DeVore. 1968. Man the Hunter, edited by Richard B. Lee and Irven DeVore; with the assistance of Jill Nash-Mitchell. New York: Aldine De Gruyter. ISBN 020233032X. Matthews, Larry E. 2007. Caves of Chattanooga. National Speleological Society, 141–160. ISBN 978-1879961272. Miller, Carl, "Life 8,000 Years Ago Uncovered in an Alabama Cave." National Geographic 10(4)(1956): 542—558. Miller, C. F. 1957. "Radiocarbon Dates from an Early Archaic Deposit in Russell Cave, Alabama." American Antiquity 23: 84. Miller, C. F. 1958. "Russell Cave: New Light on Stone Age Life." National Geographic 113: 426–437. Rogers, William W. 1994. Alabama: The History of a Deep South State. University of Alabama Press. ISBN 0817307141. OCLC 28634588. Rosenberg, Kenneth A. 1994. Wilderness preservation: a reference handbook. (Contemporary world issues.) Santa Barbara, CA: ABC-CLIO. ISBN 087436731X. Winters, Howard. 1963. "The Archaic Period" in Illinois Archaeological Society Bulletin. volume 1. History of "Russell Cave National Monument"
This page was last modified on 21 July 2015, at 15:21.